All folders you create for storing files are kept on OneDrive. OneDrive gives you two folderson your iPad — Documents and Pictures — for storing files, and you can create folders of your own, as well as subfolders. If you want to create a subfolder (a folder inside another folder), open the folder that your new folder will go into. To open a folder, tap or click its name. Tap or click the Create button and choose Folder on the drop‐down list. Searching: Enter a search term in the Search box to search for a folderor file. The Search box is located in the upper‐left corner of the window. Sorting: Tap or click the Sort By button and choose an option to rearrange folders and files in the OneDrive window. Sorting is helpful for finding a folder or file in a long list. Details view presents detailed information about folders and files— when they were last modified, whether they are shared, and file sizes. Thumbnails view presents folders and files in thumbnail form. Displaying the Details pane: Select a folder or file and tap or click the Show or Hide Details Pane button to open the Details pane and get detailed information. You can also display the Details pane by right‐clicking a folder or file and choosing Properties. The OneDrive window in Details view (top), Thumbnails view (middle), and Thumbnails view with the Details pane showing (bottom). Tap or click the check box on a folder or file to select it. Before you can rename, delete, or move a file, you have to select it. The drill‐down method: Starting in the OneDrive window, tap or click a top‐level folder to display its subfolders. If necessary, keep drilling down this way until you reach the folder you want to open. 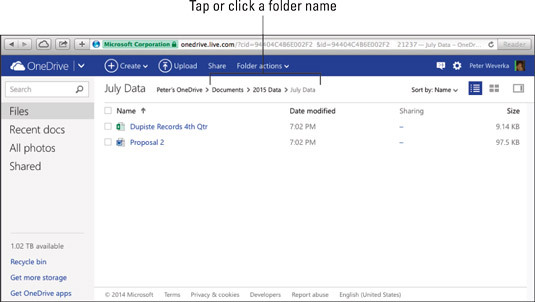 The OneDrive Navigation bar method: The OneDrive Navigation bar — located beside the folder name — lists the path to the folder that is currently open. To backtrack, tap or click the name of a folder on the path. The browser button method: Tap or click the Back or Forward button in your browser to open a folder you previously opened. Tap or click a folder name on the Navigation bar to open a folder. To return to the top‐level OneDrive window, tap or click the OneDrive button, or tap or click Files in the OneDrive Navigation pane. By bookmarking a folder in your browser, you can go straight to a folder without having to navigate to it on OneDrive. After you choose the bookmark (and enter your ID and password if you haven’t signed in yet), the folder opens. Moving a folder: Tap or click the Manage button and choose Move To on the drop‐down list. A dialog box opens with a list of your folders on OneDrive. Select a folder in the list and tap or click the Move button. You can also right‐click a folder and choose Move To. Deleting a folder: Tap or click the Manage button and choose Delete on the drop‐down list. You can also right‐click and choose Delete. Renaming a folder: Tap or click the Manage button and choose Rename on the drop‐down list. Then enter a name. You can also right‐click and choose Rename.